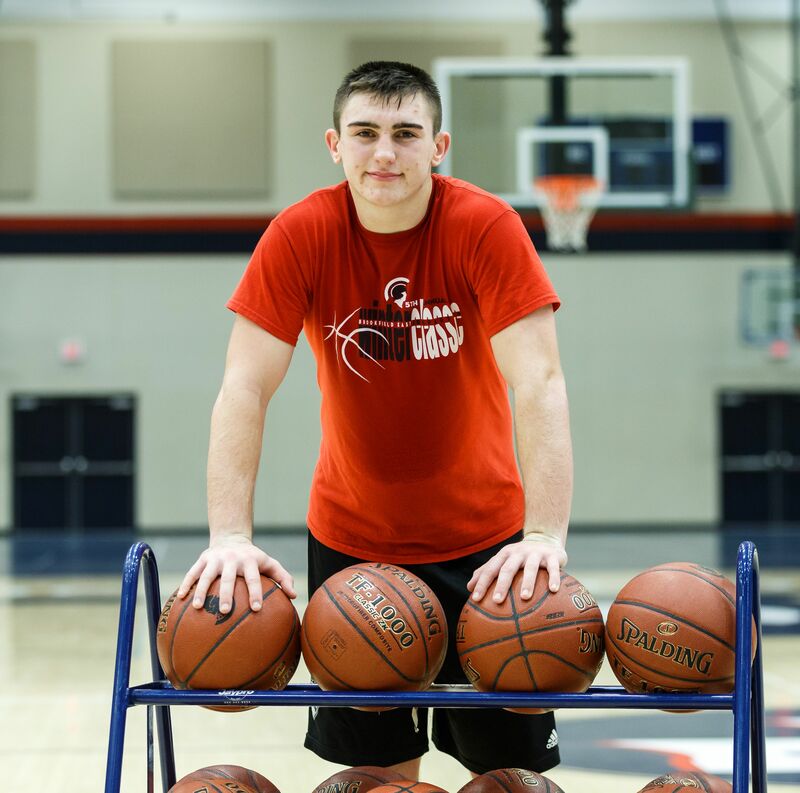 No matter what Brookfield East senior Jake Graf does for an encore with the Spartan basketball team this winter, it is going to be hard to top what happened in the fall. That's because Graf quarterbacked Brookfield East to the first WIAA State Championship in school history - a 42-36 thriller over Monona Grove on Nov. 18 at Camp Randall Stadium. All-State running back Sam Santiago-Lloyd received some well-deserved credit, scoring a state record 5 touchdowns and rushing for 197 yards in the title game. But Graf also was a key to the Spartans victory, adding 179 yards rushing and a 22-yard touchdown pass to tight end Patrick Cartier. "One of his best attributes were being calm and poised," first-year coach Ben Farley said. "Leading up to the year, he knew this was his opportunity to run with it. We had a strong line and a good running back. Jake has good skills and he works hard." The thought of winning the state title is still sinking in for Graf, who is a key member of first-year coach Joe Rux's basketball team this winter. "It still hasn't set in three weeks later," Graf said recently after basketball practice. "We get fitted for our rings tomorrow. It's still surreal. I can't even believe we're state champions." Farley talked to all the seniors at the beginning of the year. "We said our goals included winning the conference, beating Central and winning the state championship," he said. "I wouldn't say I expected us to win the state championship but I knew if we really got on a roll and did what we could do, it was definitely a possibility. We could get there. We did get on a roll and we made it happen." Graf was the junior varsity quarterback as a sophomore and then was the backup quarterback and played fullback and safety as a junior. He earned honorable mention honors this past season, rushing 165 times for 1060 yards (6.4) and 12 touchdowns while completing 49 of 85 passes (.579) for 669 yards and 6 touchdowns. "His toughness, game in game out is one of his strengths," Farley said. "He is very tough running the football. He refuses to go down. He got injured (AC joint left shoulder) and played through it. He is like having another coach on the field. He knows the game inside and out. He understands and he's smart." When Santiago-Lloyd suffered an ankle injury, Farley talked about how Graf stepped up big time. But Jake was quick to credit his teammates when Santiago-Lloyd went down. "There really wasn't any more pressure. We needed to make longer drives," Graf said. "I knew Sam could make something out of nothing, but I wasn't too worried that we weren't going to be able to do our stuff. "We matched up well and we have great backup running backs. We had Gaven Post and Caleb Wright back there just waiting. Obviously they are not the level of Sam, but no one is. You can't totally replace him, but we had two good replacements and they did their job and I just did what I normally do." Graf played 11 varsity games as a sophomore on the East basketball team, but then exploded as a junior. He averaged 15.2 points in 21 games and was one of two juniors on the Greater Metro Conference second-team all-conference. The Spartans didn't win a game in conference play (0-14) and finished the year with a 4-20 overall record. It's not surprising being such a 'team guy' that Graf was disappointed. "I didn't look too much into it," he said. "Obviously I just wanted the team to win and we weren't able to do that. So it was a disappointment. "If I was just looking at myself, I thought I came in and I did what I thought I could do. But I felt I could do a little bit better. It seemed like every game I would miss an easy lay-up or something and I would always kick myself for that. Overall I thought I had a pretty good year but obviously I would have liked to contribute to some wins actually." This year Graf hopes things are different. "Win. That's first," he said. "Obviously I feel we need to compete for a conference championship. It's wide open. So I don't see why we can't come together and take it. Obviously we have some confidence. We have that hunger to improve from last year. But we know we can win because we did it in football." New basketball coach Joe Rux was familiar with Graf's abilities after taking over the job. "When I took the job I heard we had a pretty good player who was a competitor," Rux said. "Obviously he had a good season last year as a junior. Essentially I knew for sure we had at least one guy I knew of who had some experience and who had a role in terms of scoring and he will help the team some. "Jake plays a big role in terms of his leadership. Obviously he can score some points but it's going to come down to the way he gets his teammates the ball. How he can share his basketball IQ with them and help them perform a little bit better. "I know a lot of people in our conference will be looking at Jake as our scorer. Therefore defenses are geared to stop him. Obviously his basketball IQ is the best thing he can bring to the table to help us right away." Graf talked about his strengths. "I think I'm aggressive. I like to take advantage of any opportunity I see," he said. "If it's an outside shot I can knock that down with a pretty good consistency. 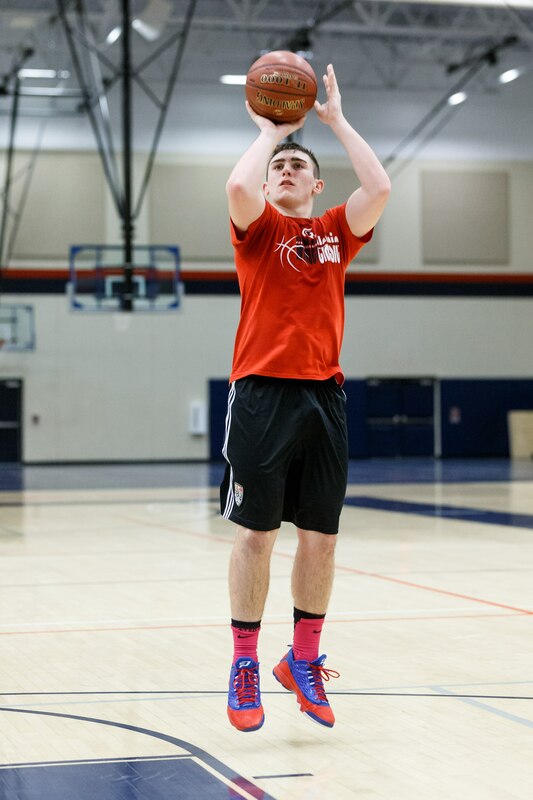 "I think I rebound well for a guard because in AAU I have to play everything. I even played some center. I know I'm not that tall, but I definitely know how to rebound." Rebounding is something his father talked to him about when growing up. "Starting young, my dad said 'You're never going to be the most athletic guy but you can box out and be aggressive for the ball. You can get rebounds.' So I've done that my entire life." But Graf will be looked on to have the ball in his hands in the final seconds of a close game. "It's a little nerve-wracking taking that last shot because everyone is looking at you," he said. "I feel confident that I will be able to make it. My teammates have the most confidence in me. So I just step up and I know I can take it and make it." Graf talked about what he needs to work on. "My passing. I have to let the game come to me instead of me trying to do everything," he said. "There are definitely things I can work on to be a better leader, especially the way I approach my teammates. "In the games I'm all tense and emotionally and I have the tendency to yell at my teammates sometimes and that's up to me to fix that. They know deep down I just want to make everyone better. But I need to work on how to change my communication." Rux could see what Jake brought to the table right away. "He likes to compete. That's certainly something that jumps out at you right away," he said. "He is a guy who certainly wants to do the right things to help the team. "You never have to worry about arguing with him or having him talk back to you. It's always going to be 'Yessir' and he makes sure that he's listening and relays what's best for the team." Rux pointed out with a new coach, Jake's role is even more important. "He has to trust in his teammates and trust in the process," he said. "This is a tough situation for him and all the guys with the new coach coming in and essentially a new team for him that he's working with as well after the graduations last year. "He's one of those guys you can count on to make sure the guys understand because he has that experience. There aren't too many situations he hasn't already seen in his career. He's been there before. "He needs to trust the process and trust his teammates and when that happens some really good things will start happening." FAVORITE MUSIC/GROUP: Rap & Pop. FAVORITE TV SHOW: Sportscenter, Archer. FAVORITE SPORTS RIVALRY/ATHLETE: Brookfield Central. MOST MEMORABLE SPORTS MOMENT: Winning WIAA State Football Championship. WHAT WOULD YOU LIKE TO DO IN THE FUTURE? Attend college and play basketball. Major in nursing, pre-med or biology.